It sure is nice to be home … After a full night’s sleep in my own bed, rising to a cup of tea made just how I like it, and spending some quiet time alone, I think I am ready to face the day. It will definitely be different at home, time to re-enter the daily tasks of dishes, laundry, and bills. I read a bit of Ann Voskamp’s book, A Dare to LIVE FULLY Right Where You Are: One Thousand Gifts, this morning, and it was spot on for what I needed to hear today. Finding joy in the every day, giving thanks, taking on the view of a child, and emptying oneself of expectations — leading to a joy in the moment. 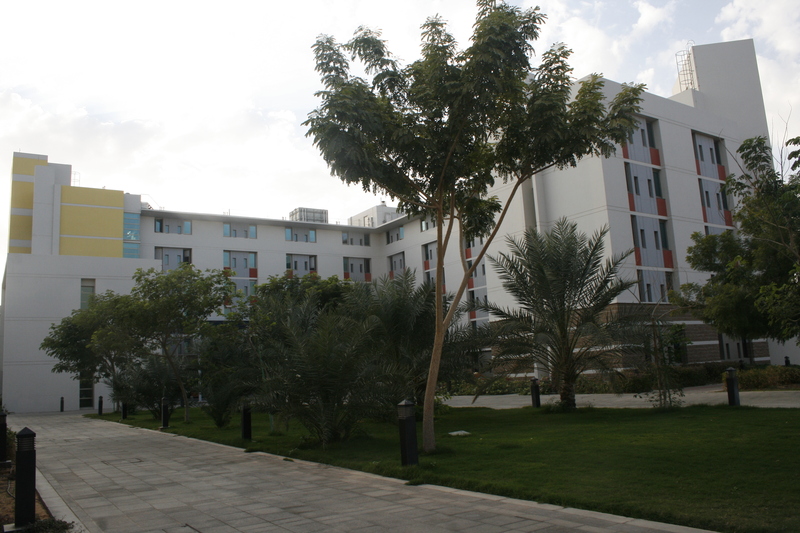 Dorm A5, our home away from home. As for the culmination of our world travel, our final day brought adventure, appreciation, and a bit of exhaustion. We left our home away from home at 8 am, planning to take a taxi into Dubai for more sightseeing before our plane was scheduled to take off at 11 pm. Our first surprise was that the taxi was not available, so we headed to the line for the bus provided by the tournament. We were fortunate to be able to make it onto the second bus after waiting only about half an hour, and thankful that we had saved the taxi fare. Our driver was not familiar with the airport and initially dropped us at the wrong terminal, but after I hailed an airport worker and got directions, we made it to the right location. Actually being familiar with the Dubai airport (odd as it seems), we were able to efficiently store our luggage for the day and hop on the metro to visit the Dubai Mall. The metro has a car set aside for ladies and children only. We became thankful for this arrangement when stop after stop the people piled into the train until we felt as if we were in Japan with bodies pressed against one another and people pushing to get off at each stop. When we reached stop 25, we surged toward the door, taking care to avoid the baby stroller. Ganmama almost didn’t make it off the train, but slipped through the doors as they were closing. 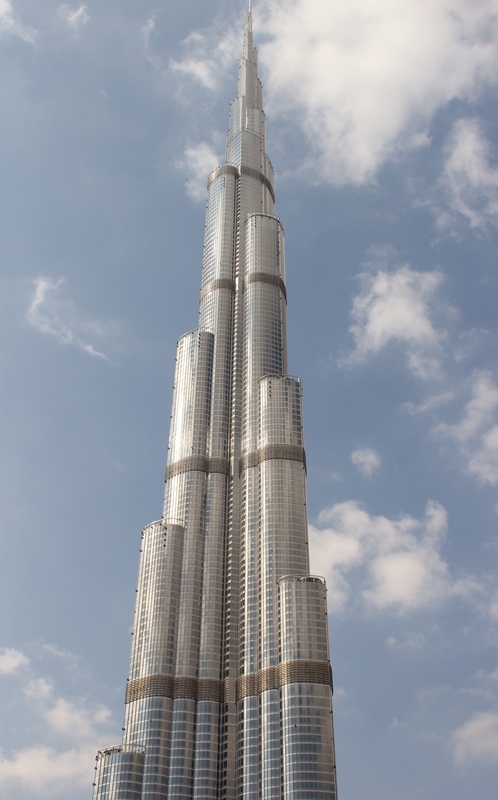 Dubai loves to boast of the tallest tower, the largest fountain display, and on and on. They can also include the longest hallway of moving walkways in the world. The walkways led us to the opulence of the mall attached to the Burj Khalifa where we would ride the elevator to the 124th floor to view the city from above. 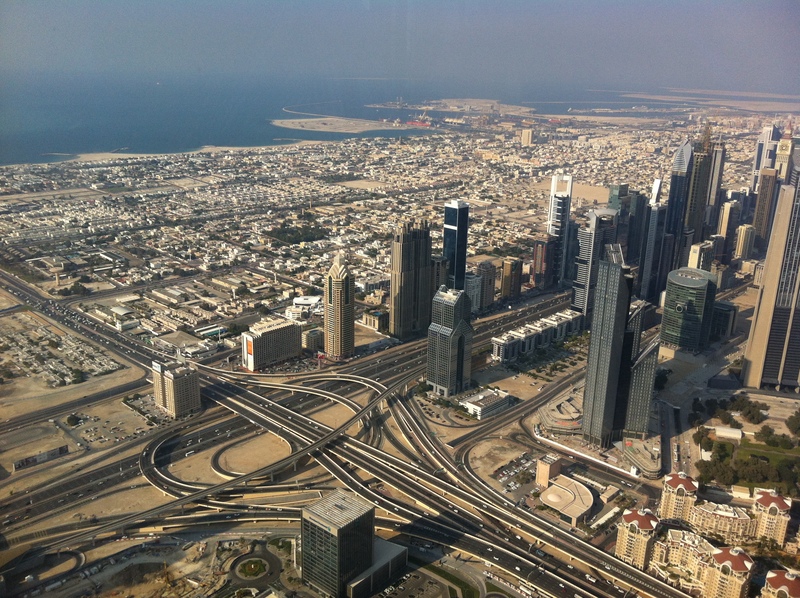 One view from the Burj Khalifa. We stood looking out the thick glass of the observation deck while unbeknownst to us a large family gathered behind us for a photo. Ganmama turned and found herself inadvertently popping her head of red hair into the frame. We ducked behind the 25 or so, until Ganmama mischievously reached a pair of rabbit ears up behind one of the men posing in the back. Giggling like schoolchildren, we were found out and the group of dark middle easterners pulled Ganmama and Drew into their family photo, laughing and cajoling one another. They then dispersed with calls of “Bye Auntie, see you next year in Europe!” and we left the tower with smiles and laughter from our brief encounter with another family traveling as well. Zoe and Drew peer off the observation deck of the Burj Khalifa. Prior to leaving Dubai for Al Ain on the front end of our trip, we had made reservations for a sunset cruise prior to our nighttime flight. Checking our watches, we realized that with the unending moving walkways back to the metro, we would be seriously pressed for time in getting back to the meeting place for our final adventure. We hurried through the mall, skirting the tourists from around the globe as we progressed through the people movers, and stepped onto the metro once again with bodies pressed close and cultures bumping against one another. We exited the train at Deira City Center to hail a taxi to the Holiday Inn Express. Unfortunately, the escalator up from the metro stop was broken and as we climbed the stairs with our bags and cameras, the press of people tight, we had to stop and rest halfway up, faint from the rush and the exertion. The metro exit was nowhere near the taxi stand, and we had difficulty locating a driver without passengers. Finally we crossed the street to a waiting cab and settled in — 15 minutes late already for our transport to the cruise. Pulling up to the hotel, I jumped out of the taxi to find the door closing on our bus. Just in time, we paid the taxi and boarded the transport. The rush and hurry was worth it as we were able to relax in comfort and enjoy the company of families from Australia and New York as we watched the sun sink low over the Arabian Gulf and the lights of Dubai illuminate the skyline. It was a beautiful end to a magnificent journey, the experience of the other side of the world and the diversity of humanity — an opportunity afforded by the game of chess and the generosity of family to help us on our way. 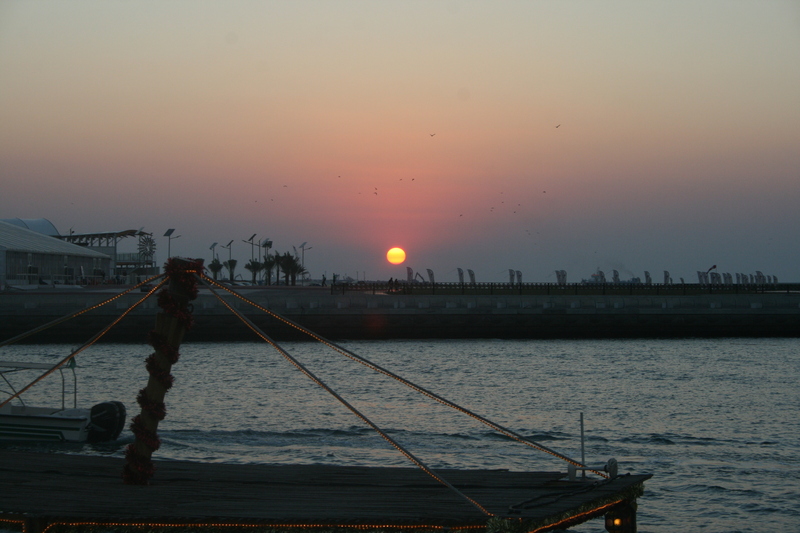 Sunset over the Arabian Gulf. 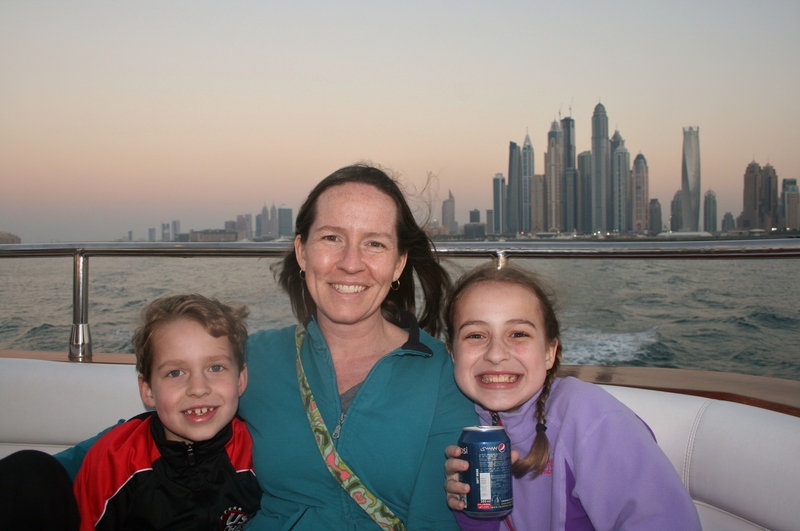 Enjoying our sunset cruise with the Dubai skyline in the background. Two bus rides later we arrived at the airport to find that our flight was delayed a little more than an hour. It turned out to be a good thing as security was tight. Not only did we go through the initial passport control and security line, but at the gate we were patted down, our carry on bags were explored, and bodies scanned with some sort of detection device. The flight was long, more than 15 hours, during which we watched movies, slept, and waited to arrive home. At the new international terminal in Atlanta, one of the security dogs sniffed out an apple that was lingering in my back pack, causing us to have to wait in the Agricultural Customs line. The contraband fruit was disposed of by the customs officers, and we were finally on our way to the long awaited for visit to Chick-Fil-A. Ah, sweet tea and the taste of home sweet home! I have truly enjoyed reading your informative and descriptive posts! You made me feel like I was also pressed on the train and rushing for taxis and buses alongside you. 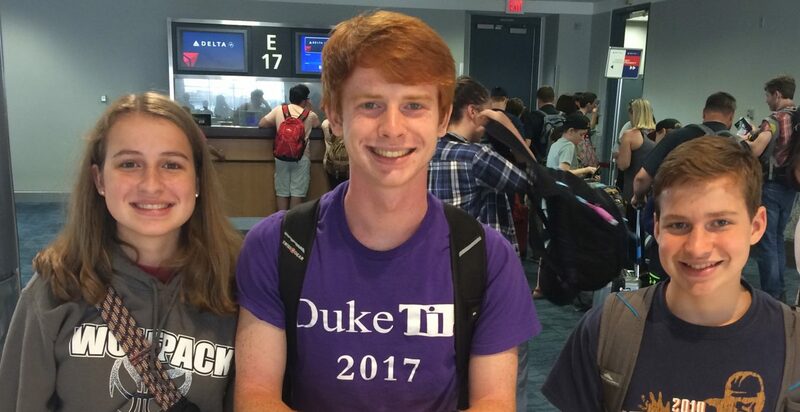 Glad you and Zoe and Drew and Kyle’s mom had the experience and made it back safely. Thanks so much for sharing! Happy New Year and enjoy your sweet tea!